Here at Banting House NHSC, we have a sizeable collection of materials of all kinds related to the life and achievements of Sir Frederick Banting. Items range from his silk top hat to a stool he once owned, from his 1920 business card to private letters, and from his Military Cross to pieces of original artwork. Very often, it’s the story related to the artifacts that grants them real significance – an old top hat is just an old top hat until you find out it belonged to Banting. Having a story to back up the items and documents in our collection can also dramatically change the significance. To illustrate this, take a look at these two letters. Leonard Brock was a scientist who worked underneath Dr. Banting at the Banting Institute for Medical Research at the University of Toronto before moving on to other things. 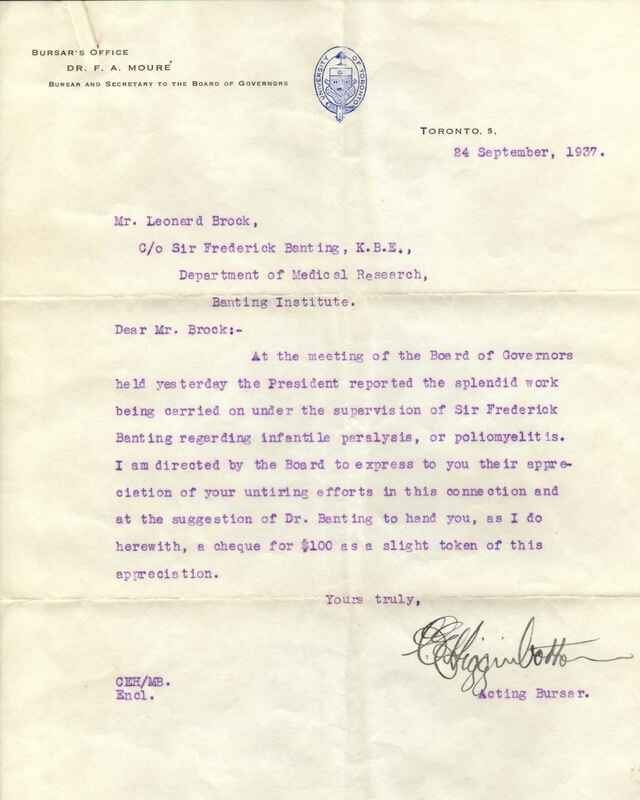 The items we have here – donated by a descendant of Brock – are a letter confirming a $100 grant to Brock from the University of Toronto on the advice of Dr. Banting and a letter of recommendation written for Brock by Dr. Banting. On their own, there is nothing especially important about these letters. 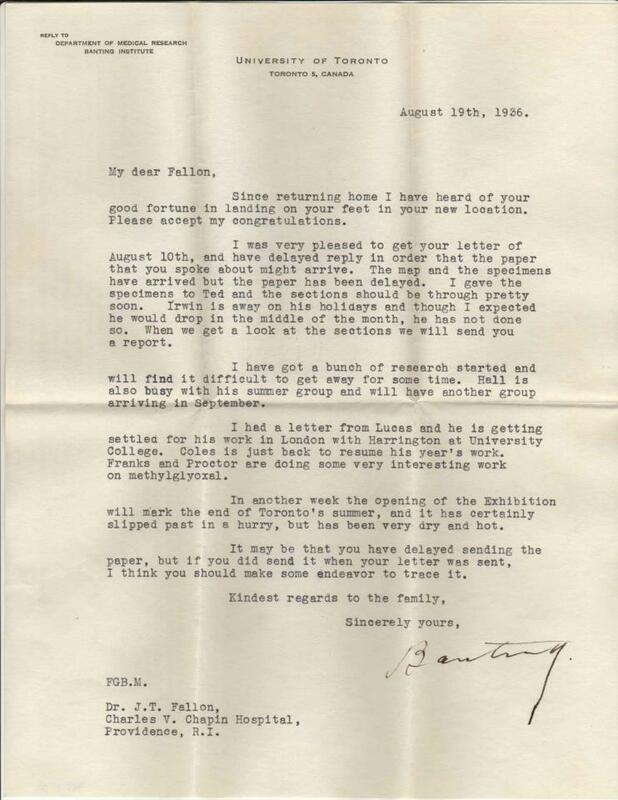 In his capacity as head of a department, it was likely regular protocol for Banting to recommend people for grants and he probably wrote plenty of letters of recommendation for his students. While the letters are connected to Banting, they appear to be more representative of Banting’s job than Banting’s person. Banting didn’t just recommend Brock for a grant – he personally handed it to him on his own time. This, and the personalized tone of the letter of recommendation add colour and depth to another story about Banting. 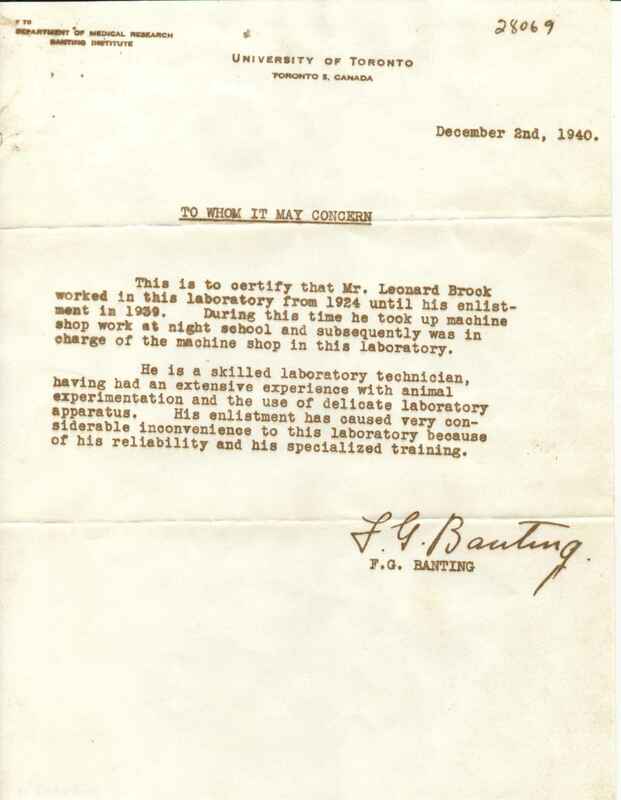 It’s important to note that Banting maintained all of this correspondence – with his colleagues and with many of his patients – without the add of modern technology. He had nothing more than a type writer and his own hands. Many people today fail to maintain contact over long distances even with new modes of communication, like Facebook. He managed to make time for a lot of letter-writing on top of his own research, his personal life, his commitments as head of the Department of Medical Research and a member of the National Research Council, and his own artistic hobbies. That in itself is a considerable achievement! These three letters, and the snippets of other documents mentioned, come together to form a story about a side of Dr. Banting that many people don’t know about. The story and the documents complement each other and ensure the continued importance of such artifacts. What happens if there is no story to go with an artifact? 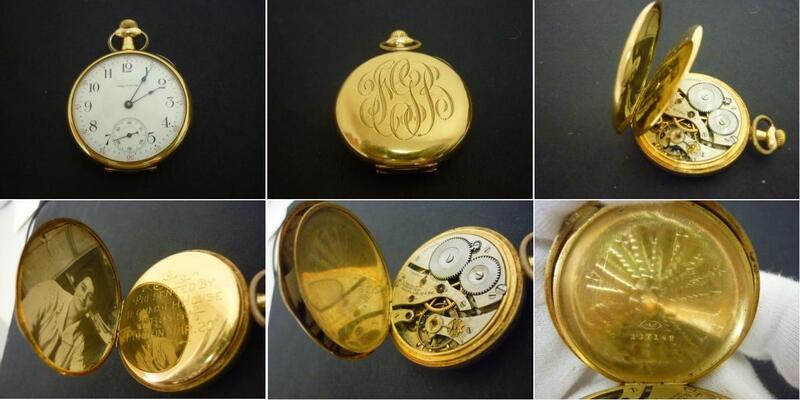 This gold pocket watch made its way to us as part of a very large donation. There was no story or explanation provided – the only thing we know about it is what we can deduce by looking at it. – We know the watch was made by the American Waltham Watch Company in Massachusetts; using the serial number ascribed to we found out it was manufactured in 1912. – The photo inside the watch is of Banting’s first wife, Marion Robertson. He married her after a whirlwind courtship in 1924 and they divorced in 1932. – The inner inscription of the watch is what begins to create confusion. It reads “Presented by the Tecumseh House Boys, London, Mar. 20 1913.” There is no record of Banting being in London prior to his moving there in 1920. There was a hotel named the Tecumseh House in London at the time and various sports teams in London’s history have been called the Tecumsehs. We have no way of knowing how this watch came to be used by Banting – if it ever was. Why was there a picture of Marion in it? Did he only use it while they were married? Was it given to her by him? What is his connection to the Tecumseh Boys? Who were the Tecumseh Boys? Artifacts like this raise more questions than they answer – while this certainly isn’t a negative thing, it can be frustrating. It would be difficult for us to display this artifact – without a story, it’s just a watch sitting in a case. There’s nothing impressive about the statement “We don’t know how, but this is somehow connected to Banting.” The letters on the other hand offer not only connection but substance. An exhibit featuring them reveals a personal side of Banting many don’t know about but that was certainly an important part of his person. It’s always nice to have the things, but it’s even nicer to have the story that goes along with them. Posted in Banting's Memoirs, Collection.Tagged Artifacts, Banting, Collection, Documents, History, James Fallon, Leonard Brock, Letters, London, Museums, Mysteries, Pocket Watches, Tecumsehs.